Welcome to Monday morning wherever you are. I don’t know about you, but this North Texas weather is beginning to wear on me. It looks like this week’s weather will be consistent for about a week; cooler and little chance of rain. I know you are as excited about the new Texas Fly Caster website as I am, so I decided to take you on a tour this Monday morning – a week after I took it live. 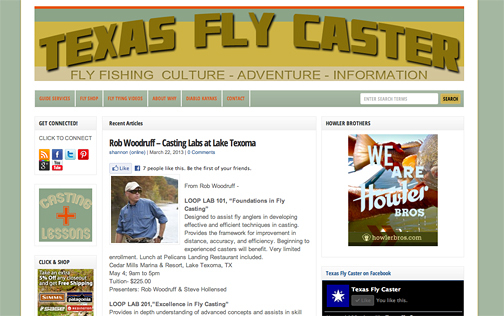 The new site design for Texas Fly Caster is taking hold and now I am actually starting to like it myself. I never thought change would be hard, but this one came with a lot of potential pitfalls that would only show themselves after the site went live. Now that things are settling in, let me take you take you on a tour. Some things once bold are now hidden on this page, while other things are shiny and new. Before we take the ten-cent tour, it is important that you the masses tiat visit dutifully every Monday, let me know if the site is loading fast enough for you and if it’s faster than the previous version of Texas Fly Caster. It should be faster, but if there’s too much fat, I’ll start trimming. ONE DISCLAIMER – Things could still be moving around a bit, but these components should not disappear from view. At the very top of the page is the header – Texas Fly Caster – and if you are on any other pages, you can click on that header to get back to the home page. The left column has drastic changes that include a box at the very top that allows you to hit all connections to Texas Fly Caster – Feed / Facebook / Twitter / Pinterest / Google+ / Youtube. If you do click on those, your view into Texas Fly Caster will expand drastically. Going down the left column, past the ads, is a series of dropdowns – TFC Reccomends / The Outgoing Tide / Organizations / XLicensesX. Click on those, and the famous links drop down so that you can visit all the places I have searched far and wide to find. Think of those links as a hub for you – for you to come to and click on as a normal hub, or an adventure in the world of wide interweb. Come here, use those. Further down, you find the boxes for Search, MailChimp (a huge insider info source), Instagram (feel free to contribute), Archives and Who’s Online. As you can tell, the more important the information, the closer it is to the top of the page! The middle column is rich with stories as in the past. Now, some will be full length, and some will be continued. All you do is click on the gold “Continue Reading” box, and the story will continue. I am still working out the “Continue Reading” function, but I hope the stories will remain exciting enough to entice your interest. Please feel free to click on the social media icons at the bottom of stories and recommend them to people you think may be interested. On the right is a fatter column, and we have paid ads, the Facebook likers, and “Topic Tags.” Those “Topic Tags” are where you look to find more posts on topics that interest you. “Topic Tags” are your best search method for digging back into seven years of Texas Fly Caster stories – hands down, no doubt about it. The “Weather” information is based on home base, but will change as we go on the road. There’s the “Moon” information, a new feature “Popular Posts” mathematically determined, and the day jobs plus a changing ad and the “feed” for Texas Fly Caster. If you have a service that aggregates feeds, or want to put the Texas Fly Caster feed on your site, feel free to do that. The “Popular Posts” area is interesting because it’s a window into what people coming from all over the world have made popular statistically. This particular site design has a huge footer section (bottom of the page), and you will find more ads, information and things like a few of the latest tweets from @texasflycaster for what they’re worth. I am still not where I want to be on those features, so expect changes (more) at the bottom of the page. Throughout, you will find more graphic artwork scattered around on the site, and that art is a link to different things like “Guide Service,” “Kayak Shuttle Service,” and several other things. 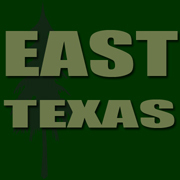 There will also be unique graphics for different topics and areas of Texas – to make them more instantly recognizable. Those graphics will be your visual cue that help you determine what / where the story is about without having to actually read it first. Below is an example of those new graphic signs. – The final chapter on fly fishing Lake Monticello. – The final chapter on Asheville, North Carolina. – The first chapter on building fly rods. Choosing a blank. On future Mondays, the sidewalk will occasionally cross memory lane. Here’s a backcast from past springs, about one of your favorite topics – Spring Hybrid Action. Remember this?